At Walden Square Dental, we want to help your child build a solid foundation for a lifetime of great dental health — and happy smiles! We provide kids dentistry for children of all ages. Our team understands that providing dental care for children is not the same as working with adults. We make extra effort to ensure our younger patients have fun, stress-free visits. Your kids will be in great care at Walden Square Dental! 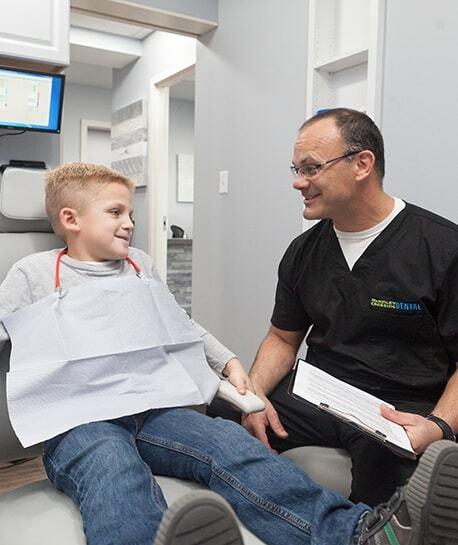 Whether it’s your kid’s first dental visit ever, or just his or her first visit to our office, we look forward to showing how easy going to the dentist can be. In these routine appointments, we perform a gentle teeth cleaning and an overall dental exam. The exam consists of checking for any cavities or signs of decay and that all teeth are coming in correctly. If necessary, we’ll take X-rays (we use safe digital X-rays), and we may also apply a fluoride treatment. Just like with our other patients, we always customize our care to the child’s specific dental needs. At the end of the appointment, our team is happy to give you tips and instructions for at-home care as well as guidance on common dental concerns for kids, like thumb sucking. Set a Positive Example — Our kids are always looking to see what we do and how we act, so make sure to not let any of your own negative feelings or fears about the dentist pass on to them. Don’t mention anything about pain or comfort. You might even consider bringing your child along to your next dental visit so he or she can see there’s nothing to fear. Play Pretend Dentist — Sometimes what makes the dentist so scary is that kids don’t know what to expect. If you “practice” at home and talk about what’s going to happen at their visit, kids will be prepared for the real thing! Have a Meet and Greet — You are more than welcome to bring your child ahead of their appointment to meet our dentist. Then, when it’s time for their visit, they’ll already be familiar with who’s going to be working with them! Have Their Favorite Toy Handy — With their favorite toy or stuffed animal by their side, kids might not be so nervous to sit through a dental appointment. We even have our own toys and blankets at our office that they can use. Tag Along in the Treatment Room — Parents can sit in the treatment room during their children’s dental appointment so they can feel safe knowing you’re right there beside them.